$9... And an Hour or So of Work... That's Worth It, Right? You know how it is when you plan something in your head? And you're excited about it? And it was the basis for everything else you were planning? And then all of a sudden something happens, and you're forced to change gears, but changing gears is, like, a huge deal? Well, that's what happened to me with this project... and it all started, innocently, at Christmas Tree Shops the other day. Okay, you probably need a little back story here. See, we're hosting a somewhat last-minute cocktail party at our house. And to be quite honest, I'm not entirely prepared to be hosting a party at my house yet. Okay, we've been in this house for 10 months now, so things should really be coming together... but filling a house with furniture and decorating is overwhelming, and as I've talked about before, I'm trying to find a balance between getting the house furnished and decorated, being mindful of a budget, and taking the time to find pieces I genuinely like. And maybe I'm too much of a perfectionist... my husband says I am... but I'm just not "there" yet.... But at this point, that's irrelevant, because now we've got 30 people coming over for cocktails and appetizers next week. So I'm forced to get in the zone. I've resolved to complete a few projects I've been lagging on in the house, and I go out to shop for some smaller "touches." And to my surprise, I really get into the zone. I'm in Christmas Tree Shops, and it all starts coming together. Here's where the "zone" takes me: (1) We'll do this party outside (please no rain), (2) I'm going with a turquoise color scheme with green accents (no big surprise here), (3) I know I have a few round and rectangular tables (to borrow) at my disposal. Perfect. 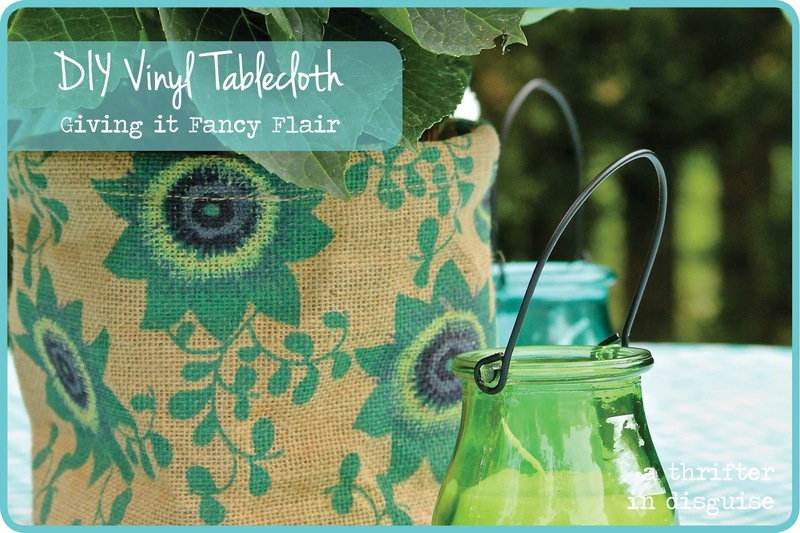 I don't want the plain white tablecloths from the caterer, so I peruse the cute vinyl tablecloth displays in the store. I decide all the tablecloths will match. 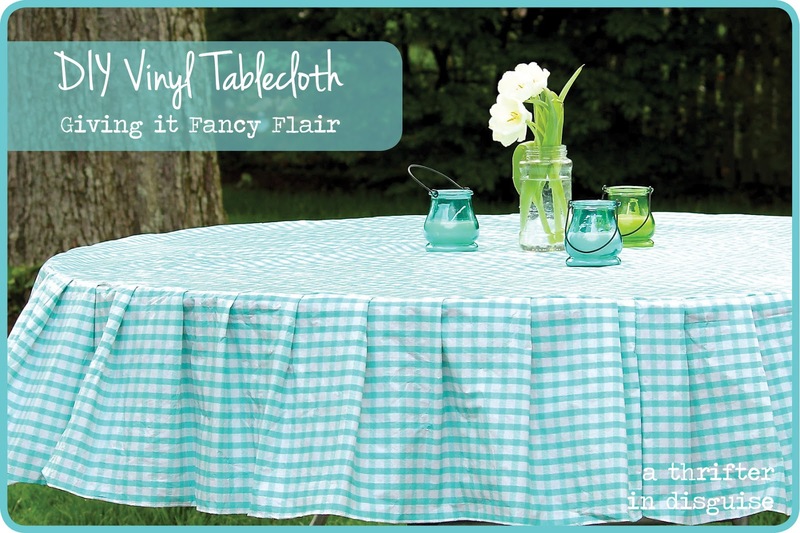 And, being in the zone, I find cute checkered turquoise tablecloths (at $2.99/each), round and oblong. I buy a bunch of them (and a couple other adorable accent pieces). IN. THE. ZONE. Fast forward two more days. I get the tables to the house. I start playing around with tablescape ideas, because I don't want to wait until the last minute (now are you starting to see a glimpse into why I may have a problem? ), and I realize: OH NO. These round tablecloths are too small! Like, way too small! I hurry to tell my husband, knowing he'll share my shock and panic... yet, he seems unconcerned. "Just get another size," he tells me. No, no, that's not going to work. Because (A) they only offer 60" round tablecloths in this $2.99 display, and (B) the tablecloths are the basis of my entire plan. "I can't just GET different sizes, husband! This is a disaster!" He shrugs. And so Operation Vinyl Tablecloth begins to come together. I decide I must sew a pleated skirt onto this ill-fitting tablecloth. And I'm not going to tell anyone, because sewing a cheap, almost-disposable $2.99 tablecloth is a really weird thing to do. But I'm telling you now, because it's my hope this will somehow justify my madness. Or maybe blogging is really a sort of therapy here... or maybe I'm just trying to make myself feel better. Step 1: Create a long strip to be used for the pleated section. I cut up an oblong tablecloth, using 12.5" strips. I was able to get 4 long strips out of a 58x70" oblong tablecloth this way. Cut the strips, then sew them together at the short ends so that you now have one long strip. In my madness, I extended my strip a little longer so that my pleats would be a specific distance apart (also because I was in trial-and-error stage). My long strip ended up being about 311" long and 12.5" wide (probably over 8.5 yards). 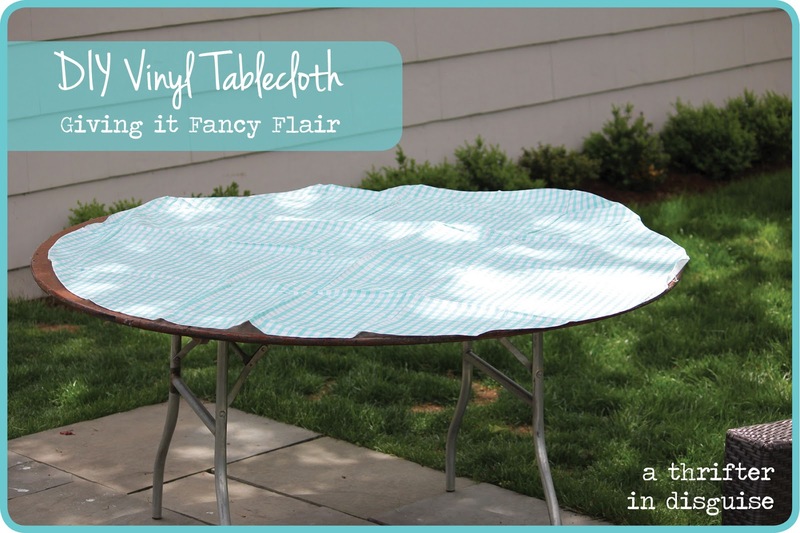 You could easily just use one oblong tablecloth (about 288"), just make your pleats farther apart. Step 2: Make/pin the pleats from the long strip onto the round tablecloth. Be sure you keep the right sides together. My pleats were about 5" apart each, and the pleats themselves were about 1". Continue all the way around the tablecloth. Step 4: Put the tablecloth on the table, and tug at each fold around the tablecloth so that each pleat is nice and straight. 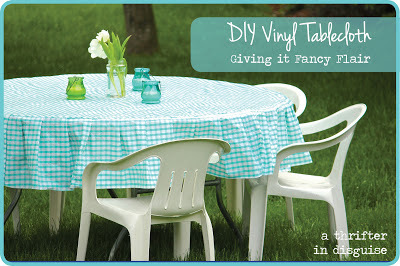 You're never going to get ALL the wrinkles out, it is a vinyl tablecloth after all! But one trick I've used to get wrinkles out of a vinyl tablecloth is to put the tablecloth in the dryer, on gentle, with a wet towel for just 2 minutes--watch the time! Then I put it on the table, nice and warm, and it sort of molds to the shape of the table. It doesn't de-wrinkle as well with the pleats on it, but it still helped a little. And Operation Vinyl Tablecloth is done! It's actually a really quick and easy project (otherwise I probably wouldn't be blogging about it). You could do this with any ill-fitting tablecloth, it doesn't have to be a vinyl one. Just make sure the diameter of your original "circle" is the same as your table before you add the pleated section, otherwise the pleats won't lay right. Also, I gave you my measurements to add on to the 60" tablecloth, but if you're having trouble calculating how much fabric you need or how far away to place the pleats, just let me know and I can help you out with that. Even if this was a little "out-there," it was still a lot less $ for about the same amount of work as my laminated cotton tablecloth. But back to reality. Wondering how the tablecloth was received? The true test: husband. When he came home from work yesterday, I asked, "Did you see the tablecloths on the round tables out there?" He replied, "Yeah! They did fit after all. See, I told you not to worry about it." Aaah. My secret's still safe. In reality, I eventually told my husband about the project, but made him swear not to tell anyone :) Another secret, I won't actually be using my kitchen chairs in the top pic for the party. They just look cuter. In actuality, we'll be using my Craigslist Plastic Party Chairs, so I felt it only decent to include a pic with them too. I love it! Very impressive and I'm always of the mind set that you can "just cut it up" to make something work! You're totally right, Kate. Now that I think about that way, I should be doing things like this more often! My mindset is definitely changing to be more like that. Thanks for the compliment! Well I think it's just such a clever idea. Love how it turned out. Great way to solve a problem! Thanks, Jann! You're helping me feel less sheepish about it... maybe I should be focusing on the problem-solving aspect of the project! Such a pretty tablecloth. I need to up my sewing skills. I would love to make something like this. Thank you for sharing your tutorial. I don't think it's weird to sew a 2.99 tablecloth. You also invested your time into shopping for them. I'm crazy too, I will always try to find a way to make do. I hate that we live in such a "throw away" mentality. I save all my gift bags and tissue paper. I'm always the crazy lady at the birthday party, grabbing all the bags and folding them up to reuse. You aren't a total nut job, just thrifty and talented! So cute! 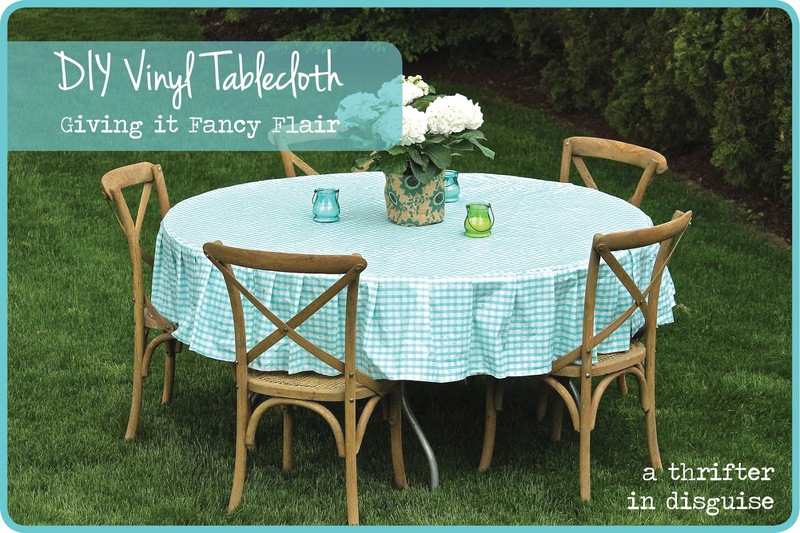 I love using vinyl tablecloths outdoors, but I've never added a cute ruffle. It makes such a difference. Thanks so much for sharing. Have a wonderful day! Thanks, Lisa! I am proud that I was able to problem solve instead of starting from scratch again! They look adorable and I am so glad you decided to share this. I find this post hilarious because it reminds me of myself! I love it! The colour is gorgeous and you did a brilliant job. Fun post too! Thanks so much for sharing at the Say G'Day Saturday linky party. I've just pinned this and shared it on Twitter and Facebook. I think it's very cute. Thanks for sharing.